The Museum of Togakure (Togakushi) School of Ninpo (戸隠流忍法資料館) is the museum of Ninja located in Togakushi, Nagano. Togakure Ninja is one of the popular Ninja Style. 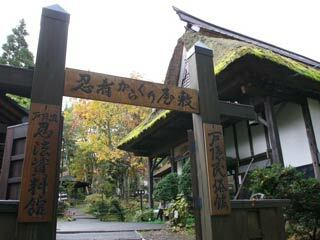 The legend said, Togakure ryu Ninpo was founded by Nishina Daisuke, samurai of Kiso Yoshinaka, in late 12th century. This museum displays all kinds of Ninja weapons, spy items, Kuroshozoku, and real scrolls and Ninja books. It has also a trick house and Shuriken school for experience. Admission: 500 yen for adult, 350 yen for kids. Togakure Style Ninpo, also called Ninjutsu, was founded by Nishina Daisuke who was samurai of Minamoto no Yoshinaka in late 12th century. He learned Ninjutsu at Togakushi Temple as one of Shugen-do practice. In 1181, he joined Yoshinaka''s army and traveled Kyoto with him. In 1884, when Yoshinaka was defeated and kill by Yoshitsune, Daisuke runaway to Iga, and he learned Iga style Ninjutsu. He combined Togakushi Sugen-do and Iga style Ninjutsu and made Togakure Style NInjutsu. Note: Togakure is another way of reading Kanji Togakusi ( 戸隠). It is most likely used Togakure for Ninja Style. It was built on the baisis of the design of an old Ninja house. Get to the exit through hideen doors and staircases. There is a little maze just before the exit.